Juvénal Habyarimana, President of Rwanda, was born on March 8, 1937, in Gasiza, in the Gisenyi province of what was at this time the Ruanda-Urundi mandate, controlled by Belgium. Habyarimana was an Hutu, whose parents, Jean-Baptiste Ntibazilikana and Suzanne Nyirazuba, were Christians. He went to a Catholic primary school, but then left to study mathematics at St. Paul College, and medicine at Lovarium University in Leopoldville (now Kinshasa). 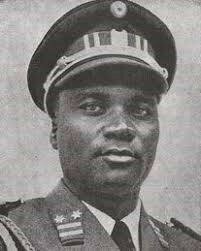 Habyarimana returned to Rwanda on November 10, 1960 and joined the government of Dominique Mbonyumutwa, who in 1961 became the first president of independent Rwanda. A member of the Rwandan National Guard, on December 23, 1961 when he was promoted to Second Lieutenant, he became the first black officer in the Guard. He rose quickly, becoming Chief of Staff to the Commander of the National Guard in 1963, Minister of Defense and Chief of the National Police in 1965, and finally General in 1973. On July 5, 1973, Habyarimana and other officers overthrew President Mbonyumutwa and placed the nation under military rule until 1978. He created a single party state with his own party, the Mouvement Republicain National pour le Developpement (MRND), in charge of the government. All political activity outside the MRND was banned. In 1978, 1983, and 1988, Habyarimana won presidential elections where he was the only candidate although in 1980 he escaped an attempted coup against his government. Habyarimana’s regime became corrupt with his wife Agathe Kanziga, whom he married on August 17, 1965, and his Akazu clan became very rich by serving as his inner circle of advisers and providing services for the State. By 1990, Rwanda began to see a rise of the “Hutu Power,” the racist and supremacist doctrine of Hutus over Tutsis. While anti-Tutsi sentiment had always existed among the majority Hutus against the Tutsi minority, Habyarimana used to that sentiment to stay in power by limiting Tutsi positions in the government and army and supporting protests against the Tutsi-controlled government of neighboring Burundi. The Coalition pour la Defense de la Republique (CDR) was the major representative of this radical “Hutu Power” trend in the country. Although Habyarimana had attempted to unite all the Hutus behind him in the campaign against the Tutsi, rival factions emerged among the Hutu including moderates who wanted to end the supremacy campaign, create a multi-party system, and end the corruption and democratize Rwanda. These moderate Hutu leaders, Dismas Nsengiyaremye and Agathe Uwilingiyimana, won in parliamentary elections in 1992, forcing Habyarimana to share power with them. They pushed for negotiations with Rwandan Tutsi political leaders and signed agreements in neighboring Arusha, Tanzania in 1992 and 1993 to integrated the Tutsi into Rwandan political life. President Juvénal Habyarimana, who accepted the agreements, was assassinated on April 4, 1994 by Hutu supremacists. His plane was shot down as he was returning from a meeting with the President of Burundi, Cyprien Ntaryamira, in Dar Es Salaam, Tanzania. Hutu supremacists falsely blamed the Tutsi for the assassination, and the new Rwandan president, Théodore Sindikubwabo, took charge of the country and initiated the Rwandan Genocide of the Tutsi and their Hutu supporters. Paul Quilès, Pierre Brana et Bernard Cazeneuve, « Rapport d’information sur les actions militaires menées par la France, d’autres pays, et l’ONU, au Rwanda entre 1990 et 1994 », Décembre 15, 1998. http://www.assemblee-nationale.fr/11/dossiers/rwanda/telechar/r1271.pdf; « Juvénile Habyarimana biography », Editors, October 29, 2017, https://www.thefamouspeople.com/profiles/juvnal-habyarimana-5719.php; Gaspard Musabyimana, « Biographie du Président Juvénal Habyarimana », May 17, 2010, http://www.musabyimana.net/20100511-biographie-du-president-juvenal-habyarimana-1/; « Habyarimana Juvénile – (1937-1994) », Encyclopeadia Universalis, https://www.universalis.fr/encyclopedie/juvenal-habyarimana/.